CAPTION THIS PHOTO: OH BABY! - What About Watermelon? You are here: Home / General / CAPTION THIS PHOTO: OH BABY! CAPTION THIS PHOTO: OH BABY! I stumbled onto this image the other day and it made me chuckle, so I figured I’d share it here on the watermelon blog. It’s either a great Photoshop effort or the world’s strongest baby. While there’s a 99 percent chance that it’s just clever photo editing, I prefer to believe that it’s real. 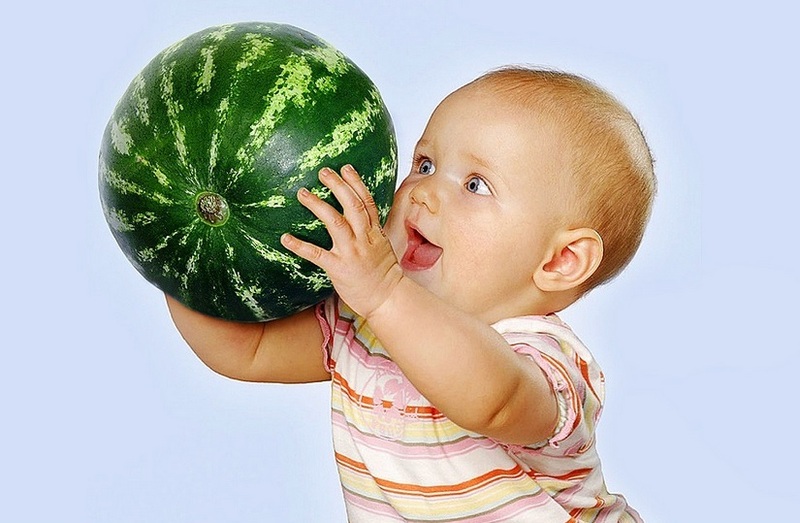 Yeah sure, an eight-pound watermelon is easy for an adult to toss around, but for a little guy (girl?) like this one, it’s no easy feat. And just imagine how strong this baby will be when he’s two or three years old. Today, he’s hoisting watermelons, tomorrow he’ll be giving piggy back rides to his dad. It’s actually kind of scary when you think about it. I have a hard enough time wrangling my three-year-old year when she’s throwing a tantrum. If you’re the parent of a The World’s Strongest Toddler, forget about it. Feel free to leave a comment with your best caption for this photo. And remember, all of the comments left on the blog this month will be entered to win our May prize – a $50 Chili’s gift card to taste test Chili’s watermelon drink lineup. Good luck! Formula? Forget the formula . Somebody cut me a slice of this. Oh Baby! How Yummy You Look. lol…Jim and Ellen have the right idea. Both hilarious. I know when I was a baby, I probably would have preferred watermelon instead of formula. Eat your watermelon, not just your greens, to become big and strong! I like the way you think A. McLamb! I know your bigger than me- But, you wont be when I’m done with you!!! I know your bigger than me – But you wont be when I’m done with ya! Or “ill show you the “WATERMELOM CRAWL”! Ha! I like your “watermelon crawl” idea, Erika. I’m trying to figure out what a watermelon crawl might look like!